Very small dumpster. This lugger style dumpster is the smallest size we offer. This little lugger is great for that garage clean out or a quick spring or fall clean of yard waste and general trash of your home. This size works well for most alley deliveries and narrow driveways. Will hold up to 20 roofing squares of Asphalt Shingles. Click here for roofing specials. Small sized dumpster. Ideal for small home or kitchen remodels. Our luggers feature flat bottoms with an overall smaller base and are delivered on smaller trucks. This style of dumpster is not as demanding on your driveway and allows for better parking on your drive or alley way. Will hold up to 25 roofing squares of Asphalt Shingles. Small dumpster. Ideal for smaller remodeling projects, spring and fall clean ups, concrete and dirt. A 12 yard lugger can hold the amount of trash equivalent to a mid-size car i.e.. the amount that will fit into the stall of a one-car garage. All purpose small to medium size dumpster. Will hold up to 28 roofing squares of Asphalt Shingles - although Roll Off dumpsters are recommended for roofing projects because of the swing gate in the back. Small to Medium size dumpster. The 15 yard lugger dumpster features a flat bottom with a smaller base and high sides. The smaller base makes it easier to position in your driveway, alleyway or yard. This size is perfect for medium sized home renovations of a kitchen /bathroom and/or basement. Will hold up to 35 roofing squares of Asphalt Shingles - although Roll Off dumpsters are recommended for roofing projects because of the swing gate in the back. Medium sized Luigger dumpster. This is the best valued dumpster and by the way the most popular size for remodeling. 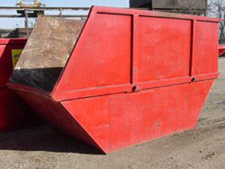 This lugger style dumpster is excellent for medium to large sized construction and or clean up projects. Being only 5½ feet wide, this container is better for driveways and alleys than the traditional roll-off containers (8 feet wide). Will hold up to 50 roofing squares of Asphalt Shingles - although Roll Off dumpsters are recommended for roofing projects because of the swing gate in the back. Small dumpster. Ideal for small projects, this dumpster is easy to load, standing at 2½ feet tall and having a swing gate in the back. It can hold the amount of trash equivalent to a mid-size car or the amount that will fit into the stall of a one-car garage. Common uses for this dumpster include household, yard debris, and spring cleanups, dirt or concrete loads. it also can be used for a two room remodeling project. A 12 yard can hold up to 28 roofing squares of asphalt shingles. Small to medium size roll off dumpster. Great for small to medium projects at home or on the job. The sides are 3.5' tall with a swing gate in the back making it very easy to load. If you are remodeling a bathroom, kitchen and dining room this may be the right size for you. Perfect for general clean up of your home or business. A 15 yard can hold up to 35 roofing squares of asphalt shingles. This dumpster is also a good size for moving. Medium size roll off dumpster. This is the best valued dumpster and a very popular size. A 20 yard roll off is ideal for medium to large sized remodeling, construction or home projects. It is easy to load standing at 4.5' tall and having a swinging gate in the back makes it even easier when loading those heave items ie.. couch, dresser, bath tub, bowling ball collection. A 20 yard can hold up to 50 roofing squares of asphalt shingles. Great for moving. Extra large roll off dumpster. Really great for extra large projects, home demo or demolition, renovation/remodeling, hoarder houses, commercial warehouse cleanings, estate home sales and cedar shake roofing. This size dumpster is perfect for heavier projects as it has a higher ton cap. Standing at 7 feet tall, a loader or stepladder is recommended for loading the container. There is a swing gate in the back. Not solely for asphalt roofing shingles, cedar and asphalt mix only. 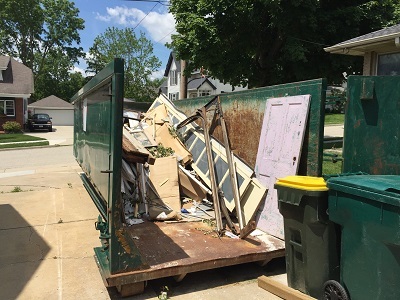 Milwaukee Dumpster Rental is a great source in helping you to find the right dumpster for whatever waste management task you may have at hand. 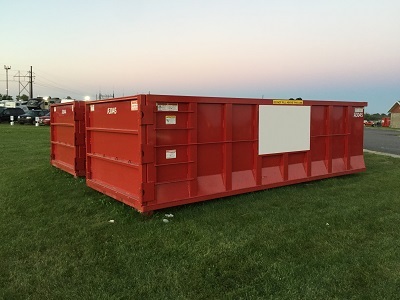 While every project has it's own unique scope and size, we can make general recommendations for the best sized dumpster to work for your purposes. What do you need a rental dumpster for? Place an order for your rental dumpster today! Save $20 when you order online! Getting a properly-sized dumpster for home cleanup will depend on the size of project. If you just need to de-clutter for spring cleaning, a 12yrd small dumpster will probably do just fine. You may have a mattress along with a couch and perhaps some yard waste such as brush. You can probably fit several bags of clothes along with various items from the garage. Old glass windows and dry paint cans go into your dumpster as well. The 20 yard medium size dumpster is the most serviceable dumpster for most residential clean ups. It can hold the trash equivalent of the size of a large van. If you order the dumpster in a roll off you will have access to a swinging gate in the back of the container, making it easy to load from all sides. This will make it easy to load large items such as decks, metal and wood cabinets, benches, old furnaces into your dumpster. *A good dumpster sizing rule: For every year that you live in your home you accumulate 1 cubic yard of garbage. Customers cleaning out their homes after 30 years most likely fill up a large 30-yard dumpster. Full estate clean-ups have been known to require two or three 30-yard dumpsters. We are all hoarders to one degree or another. As a rule - Items collected to try to save money in the future may cost hundreds of dollars in dumpster rental costs somewhere down the road. A 1,200 square foot home with a basement and garage filled with household collectables can require up to 6, 30 yard, large dumpsters. Milwaukee Dumpster Rental can supply 40 yard dumpsters for such large residential clean ups. It is easier to list the items that cannot be placed into a dumpster. Most household items are allowed such as solid food, plastic, metal, clothes, wood, cardboard, paper, tables, chairs, lamps and glass. What Size Dumpster Do I Need for Moving? It’s a good idea to rent a dumpster whenever you move. It’s the perfect opportunity to go through all of your items and de-clutter. Try placing a smaller dumpster—8 yard, 10 yard, 12 yard or 15 yard—next to your moving truck and purge as you go. As always, hazardous and restricted materials such as paint, tires, electronics and large appliances should be placed off to the side for later pick up by your local government. When you live 30 to 40 years at one residence you may discover you no longer need nor want many of the items you have accumulated. A large 30-yard dumpster is just what you need to downsize your possessions into a more manageable amount. Depending on your lifestyle, two 30-yard roll off dumpsters may be needed. Contact us to find out what dumpster size is best for you. Dumpsters for Your Business—What Size Do you Need? Whether you’re just starting a business or growing your company, at some point a you’ll need to rent a dumpster for demolition and new construction. A 20-yard dumpster is medium in size and can handle most of the needs of a growing business. Small 2-yard or 4-yard dumpsters with lids in the back of your business are perfect for daily operations. Many businesses find a single 12-yard dumpster to be a better solution for the back of their building since there are fewer pick-ups and more room to fit larger trash items. It would be best to order a 20 yard or 30 yard for your local fair. Church festivals, local art and music shows tend to generate plenty of trash. Literal tons of plastic drink cups and plates, food, and general refuse can accumulate over any weekend at one of the many summer festivals in SE Wisconsin. Residential construction projects can require different dumpster sizes throughout the process. The largest roll-off dumpsters (30 or 40-yard) is usually required during the demolition phase of a remodel. This will handle the bigger, heavier material such as plaster, drywall, concrete, siding, roofing and sub flooring. The Lugger has a smaller footprint so it is easier to manage on your driveway. Most cost effective way of disposing trash because of its bigger size and ease of loading. When your remodeling project is entering its finishing phase with painters, electricians and finish carpenters, an 8 yard or 10 yard lugger dumpster can be the right size for the plastic / cardboard wrappings and wood cut offs. What Dumpster Size for a Full Home Demolition? For a 1,200 sq. ft home, between 8 to 12 30-yard dumpsters may be needed for a full demolition. 40-yard containers are cost effective in the demolition of a home when loaded with a machine loader such as a Bobcat or Excavator. You can save money when you order 12-yard dumpsters for dirt and concrete. These materials are recycled so dumpsters can be offered at a lower cost. Place an order online for a rental dumpster and save $20. 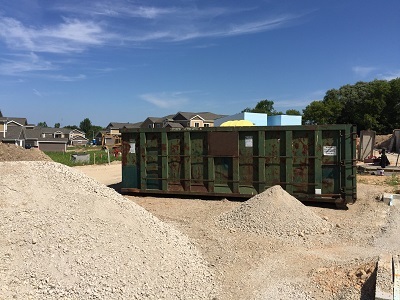 Whether for commercial or residential construction jobs, 30-yard roll off dumpsters are the preferred choice on job sites. The 30-yard is a large dumpster that will handle the weight and volume of general construction waste. This dumpster has a swinging gate in the back, allowing easier loading of shingles, concrete and large wood cut offs like trusses. The 30-yard is usually about 5 feet tall, 22 feet long and 7 feet wide. Most workers are able to easily load a container after the dumpster gate is closed in the back. The Largest dumpsters, such as the 40-yard roll off, stand 7 feet tall and tend to be too tall for many workers. This can lead to wasted space as a result of workers carelessly tossing trash over the sides of the container. Due to this, 40-yard dumpsters work best with large loaders. What Size Dumpster will I need for new construction? There are variables, but generally three or four 30-yard dumpsters are needed for a 2,500 sq ft new construction home. You may just need a 12-yard at the very end of your building project. We recommend staying with the 30-yard because you can always fill any additional dumpster space with the excess trash from moving. Packing materials, old furniture and boxes can be mixed with construction trash. What Size Dumpster do I need for Garage Demolition? A 1½ car garage should squeeze into a single 30-yard dumpster if you are mindful of the way you are loading your dumpster. Keep your materials flat as you load. If you need to remove the slab this will require an additional 12 yard roll off dumpster for concrete. A 12 yard dumpster is the largest dumpster we offer for concrete due to the maximum weight the truck is allowed to haul, but the price of a 12-yard dumpster is cheaper than a regular debris dumpster with a ton cap. When the concrete is kept clean— with very little dirt in the load and no other trash—we are able to recycle the concrete and offer it at a cheaper cost to you. “Unclean” concrete dumpster will be treated as a regular dumpster and is subject to ton cap charges. A 12 yard dumpster is the largest dumpster we offer for dirt due to the maximum weight the truck is allowed to haul. It cannot be heaped into a small mountain. It must be kept “level full”. Level with the top of the container. We offer these dumpsters for dirt at a lower rate because the material can be recycled. These dumpsters must contain dirt only “Clean Dirt”. If the dirt has any other material mixed with it tonnage cap rates may apply. When concrete and dirt are mixed together, it’s considered a “heavy mix”. No other material is allowed other than dirt or concrete, otherwise regular dumpster rates may apply. Lower rates and prices are offered on the 12-yard container because the materials are recycled. The 12 yard is the biggest container offered for this concrete, asphalt and dirt. Dumpster loads may not be heaped. What Size Dumpster do I need for Roofing? A 1,500 sq ft house with one layer of asphalt shingles usually requires a 12-yard dumpster. A 12-yard dumpster can hold up to 28 roofing squares. Keep in mind the dumpster size you need for roofing depends on how many roofing squares you have to remove or “tear off”. Make sure you account for the number of layers of roofing you need to remove. Order the No Ton Cap roofing special to get a cheaper dumpster. Recycle your asphalt shingles and save up to $300 on large roofing projects (not applicable to cedar shakes). Dumpsters must be kept to asphalt shingles, tar paper and nails only. If the load is not deemed as “clean shingles” regular dumpster terms and rates will apply. Find the best sized rental dumpster for your needs in Milwaukee. Milwaukee Dumpster rental is the best waste management source for a dumpster / roll off for your remodel, garbage, trash, waste recycle needs. Serving Southeastern Wisconsin with longer rental periods, same day service and no hidden fees. For The Best Price Choose Milwaukee Dumpster Rental®. Find your Milwaukee area dump.